I know, I know. Many of you are wondering when I’m going to write about the violent realities of a war-torn Israel but it’s simply not what I’m experiencing right now. 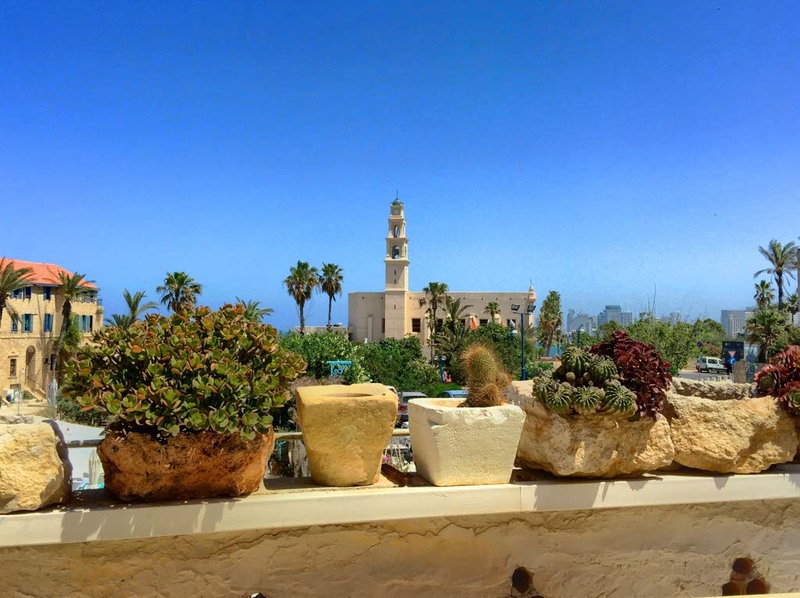 Today, I toured Old Jaffa. 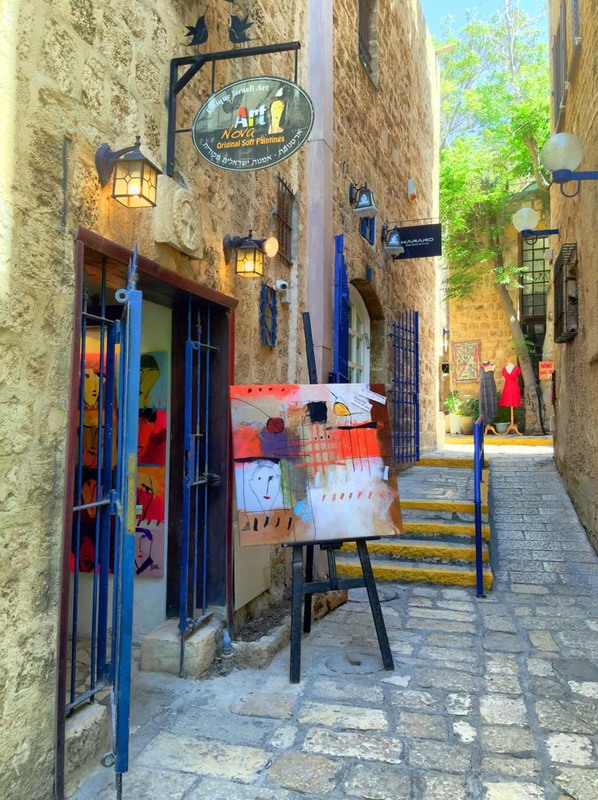 Narrow streets and courtyards filled with markets, vendors, ancient buildings sometimes restored and sometimes not, museums, shops, and galleries make up the city of Jaffa, Israel. I wandered through the streets for hours today and this is what I enjoyed. We first walked along Jaffa Port. Although it’s no longer used as a port, many sailing ships lined the dock. Here you can take sailing lessons or fish from the pier. Locals cast their long lines into the Mediterranean Sea with hopes of reeling in their catch for the day. 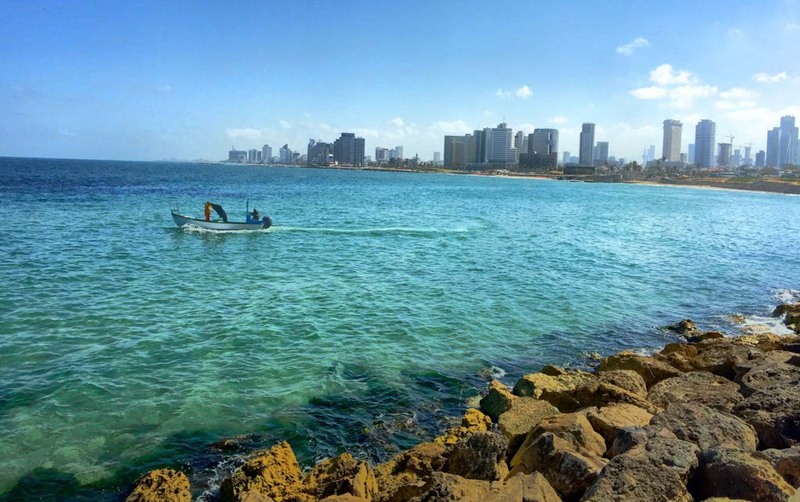 A few small boats dotted the water and Tel Aviv lay in the background. I said hello to the fisherman as I walked by. Most greeted me with a smile or light, casual conversation. We weaved through the streets and up the mountainside. Small shops selling jewelry, clothing, paintings, and arts and crafts filled the narrow streets. I browsed in several stores without purchasing anything. It was like being in Laguna Beach with unique boutiques and original artwork. Ilana Goor Museum features original sculptures and deigns of the artist Ilana Goor and other artists. It also serves as her private home. 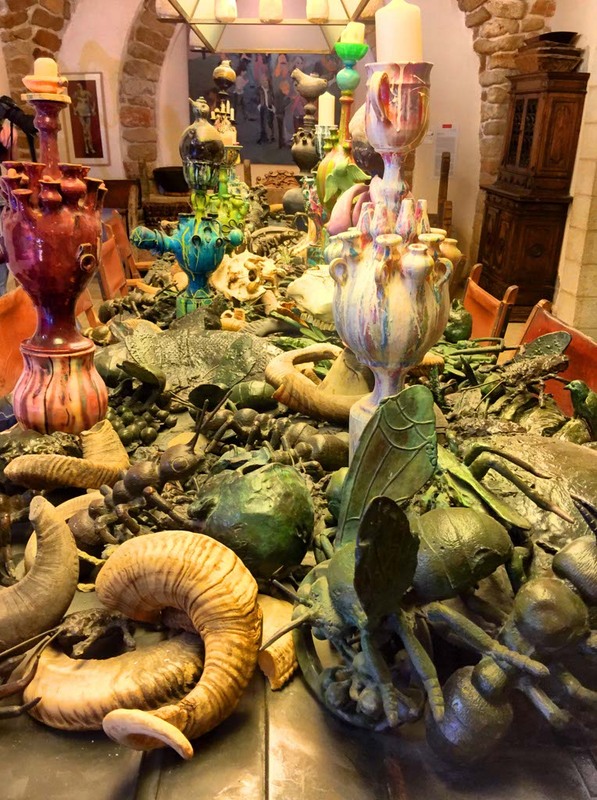 We explored the museum and admired her eclectic collection. Goor claims that it is only if one touches, feels, and uses art that one can understand what it really is. 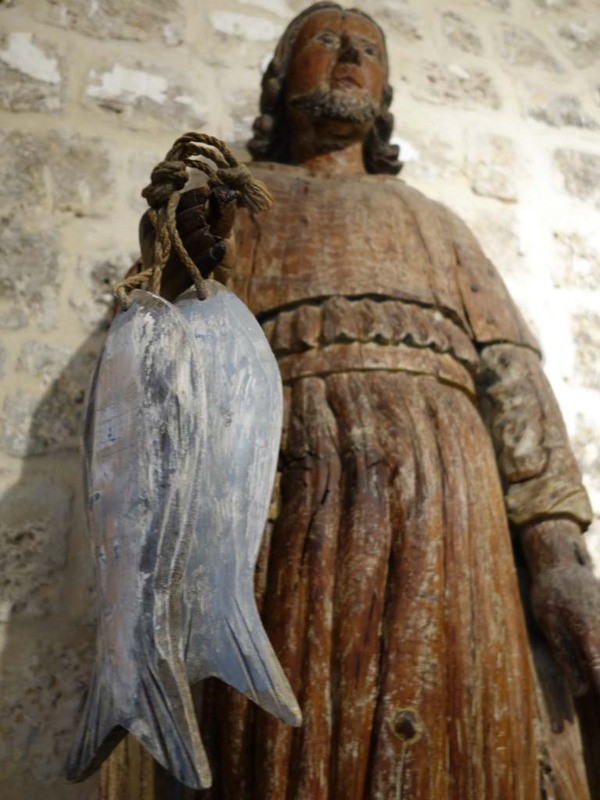 Rather than being exhibited in a sacred space, the museum’s art is interlaced with life itself- an art form that is not out of reach, but easily accessible to the visitor. We even had the opportunity to meet Ilana. Regardless if art interests you or not, the views from the top floor of the museum are not to be missed. My day continued with a visit to Carmel and Levinsky markets. When walking through the bustling streets, I was amazed by the long line of colorful fruit and vegetable stalls. Shopkeepers were wonderful for allowing us to taste their products. 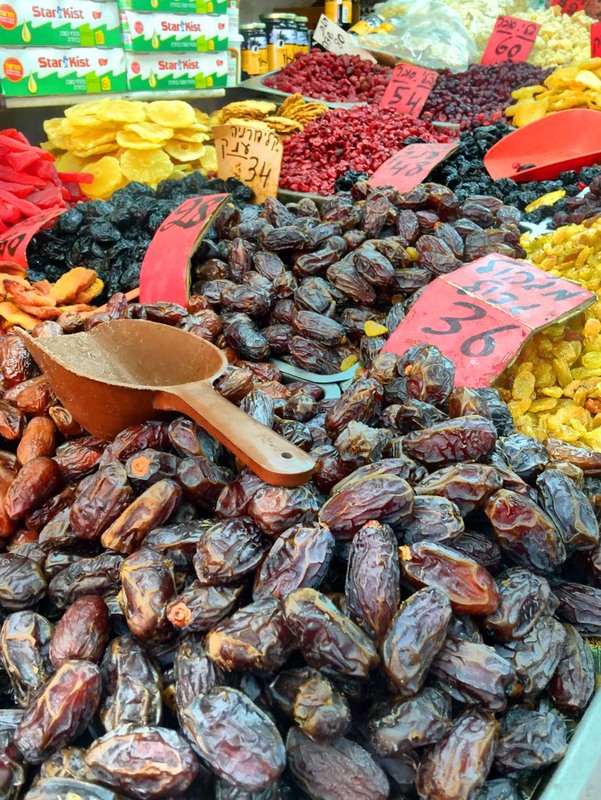 I tried several dates, nuts, dried fruit, bread and pastries, and spicy olives. The market offered the perfect combination of flavors, colors, tastes, aromas, and textures. I chatted with the shop keepers anout the weather and my experiences in Israel so far. One man had been to California before and he asked questions about LA and certain food areas. Another man asked about my flights and what brought me to Israel. 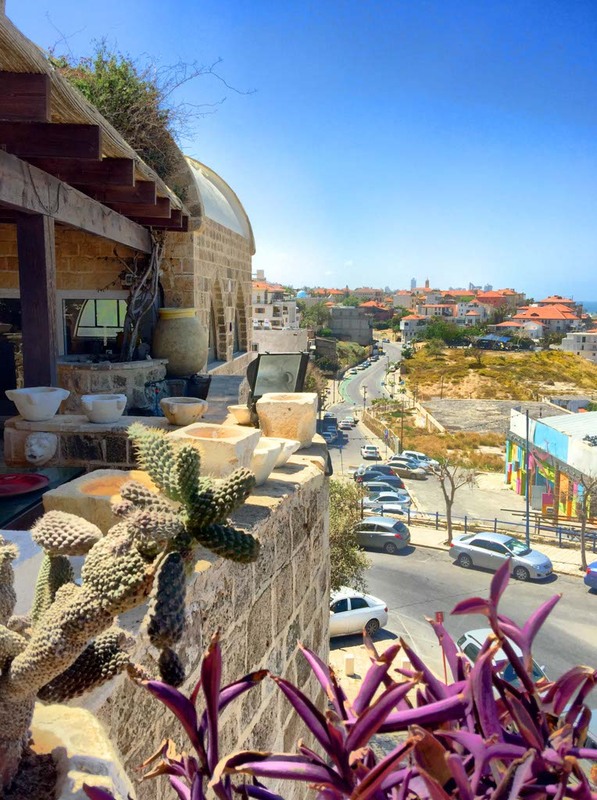 Although I was obviously a tourist, I felt like I was getting a look at daily life in Jaffa. 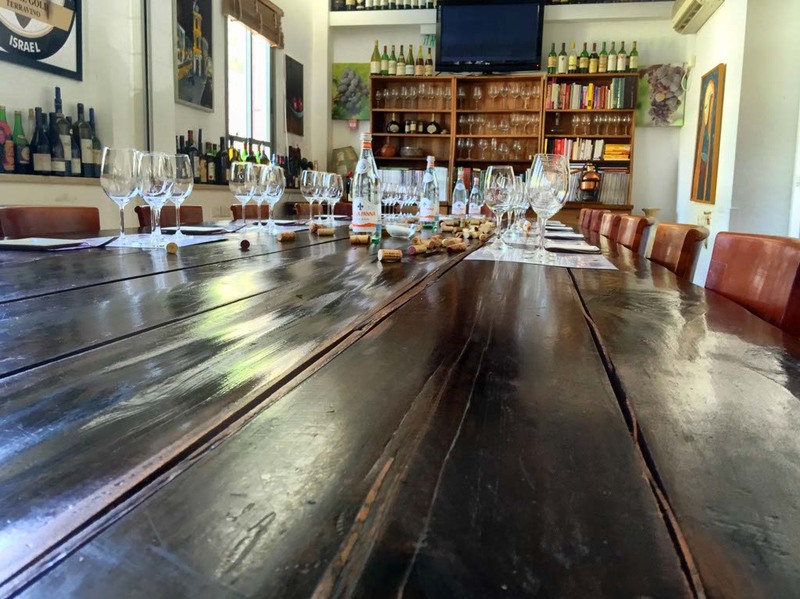 We finished up our tour of Jaffa with wine tasting at The Grape Man Wine and Spirit Center. I had no idea about the rich history of wine making in Israel. After trying a few glasses of local wine and listening to the history of wine in Israel, I was ready for the short walk back to the hotel. The sun was beginning to set again in Israel yet I saw the city in a whole new light. There is definitely violence in Israel and we’re not talking about petty theft in the streets. We’re talking about bomb shelters and Iron Dome missile defense systems, but I spent the day in a beautiful city wandering through the streets and interacting with locals. I spent the day taking photos and eating fresh foods. I spent the day looking at the stunning Mediterranean Sea and unique artwork. This is the only Israel I know so far. *Tomorrow I will tour Tel Aviv including Sarona, Ha Tachana, Tel Aviv Port, and Nahlat Binyamin Pedestrian Mall. Follow along on Facebook, Twitter, and Instagram for up-to-the-minute photos or stay tuned here and on the website for more Israel posts. I will be using the hashtag #IsraelBucketList during my 6 day visit. I’m here thanks to the support of Israel Tourism, but all thoughts and opinions, like always, are my own. 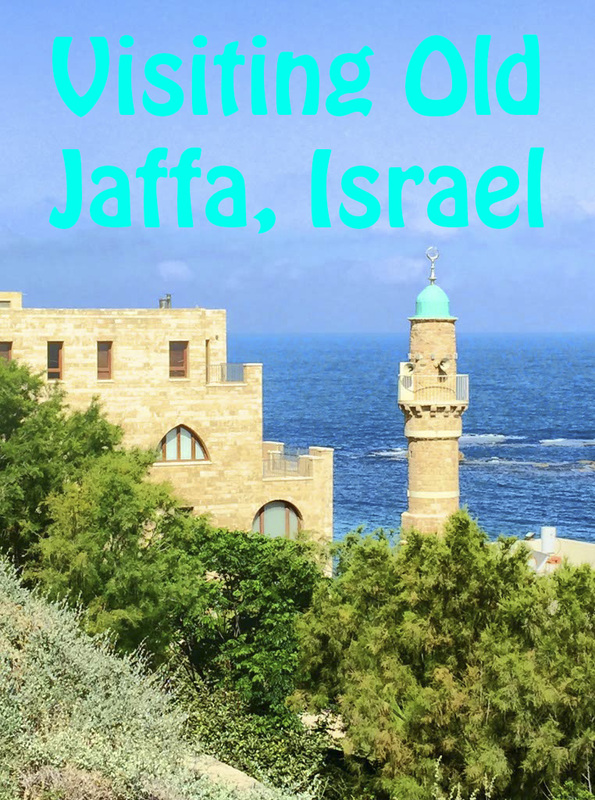 This entry was posted in Israel, Travel and tagged bucketlist, Israel, Jaffa, Old Jaffa, travel by lesleycarter. Bookmark the permalink. Which areas did you visit? What was your favorite experience? Wow, this sheds a whole new light on Israel. Thank you. Looks amazing Lesley. Looking forward to your next post. I know Israel has long term difficulties but it is nice to see and hear a different side to it also. It gives me a broader insight into the country rather than viewing it through a ‘war’ perspective all the time. I honestly didn’t know what to expect when traveling to Israel. I had heard so many war stories too, but I’d also heard about the immense beauty. I’m grateful that I didn’t just follow the word of the media. The beauty is everywhere. 🙂 Have you traveled to this area before? I think Jerusalem will have the biggest impact on me during my time in Israel but Tel Aviv has been amazing. No post today but surely I’ve have something new again tomorrow. Loving the Israel posts! And enjoying the frequency- I’m living vicariously through you as I’m here at work! Have you been to Israel before? I went to your site to see for myself, but I didn’t notice a search button. Do you have one? Hey Lesley! Thank you for visiting my site! I realized that my “Search” widget was deactivated! Thanks for alerting me to that. I have not been to Israel. Definitely on my bucket list! My posts revolve largely around Spanish-speaking countries, since I am a Spanish teacher. Can’t wait to see more Israel posts from you! What is your favorite Spanish speaking country? What one is the highest on your list that you haven’t visited? Hey Lesley- I have to give you a complicated response to a simple question! It is nearly impossible to pick a favorite Spanish speaking country. Spanish-speaking countries have offered me something different depending on what stage I was experiencing in my life. When I was in my early 20s with nothing but a tent and a pair of hiking boots, I was all about Central America- the dirt cheap prices and the laid back atmosphere. I spent 8 weeks bussing, hiking, and camping from Belize City, down by boat to Guatemala, down through El Salvador, Nicaragua, Costa Rica, and Panama. I spent from $10 – $20 per day. Now in my late 20s, I’m obsessed with Spain. I leave for Spain this July for my second trip full of museums, seafood, olives, and tinto de verano. I will go to Peru (Lima) for the first time this December for New Year’s Eve / my birthday, and then in February 2016 I will go to Colombia with girlfriends. Colombia (Cartagena, Bogotá) has been on the bucket list a long while already! So glad we have finally put the plan in motion. Slightly off topic is that after Spain this summer I will rent an apartment in Berlin, in Kreuzberg. I studied abroad in Germany (Trier) and haven’t been back in 7 years! On my way home I will visit friends who recently moved to London (also my first time there). I have a lot of amazing Bucket List travel coming up to look forward to! What’s your next stop after Israel?! Lovely pictures. 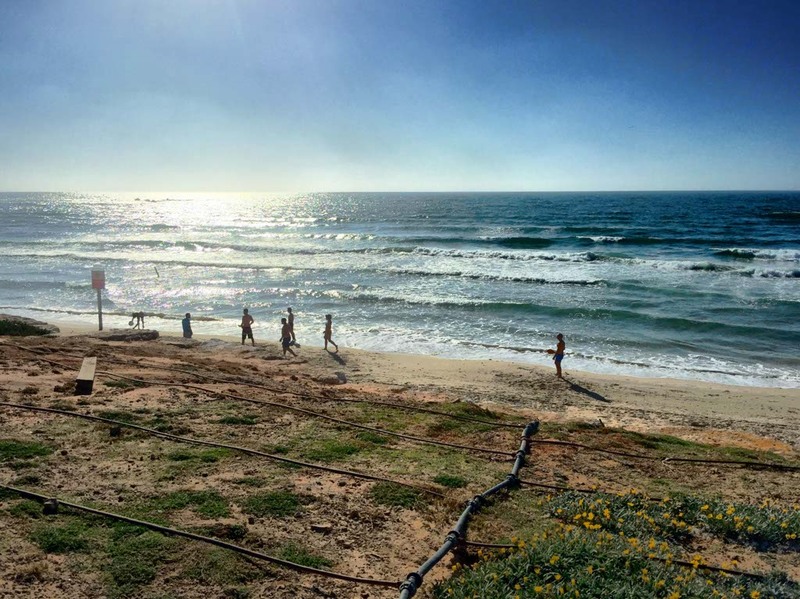 I was told Israel looks a bit like SoCal. Or SoCal looks like Israel. Except Israel has more charm. Great piece. Hope you are enjoying your tour. I really noticed that at the beach in Tel Aviv. The trees, the sand, the waves… it all reminds me of being home in Southern California. Great post. Beautiful photos as well. There is no need to justify not dwelling on the negative aspects of any location. Probable a nicer/safer place to be right now as opposed to some cities in the Americas. Thanks for your positive outlook. I was torn between including the recent conflict or avoiding it completely. Since I usually only write about my actual first-hand experience, I decided to leave it out. I feel safe here. I would bring my family. It is an amazing destination. I love love love this post. The views are amazing. It is also amazing how much propaganda the media uses. There are horrible parts to every country, and beautiful parts too; unfortunately the bad stories are the ones that make the news. Thanks for sharing this lovely perspective. I would happily bring my family here and feel safe doing so, but I do use caution when traveling to any country. Is Israel on your list? 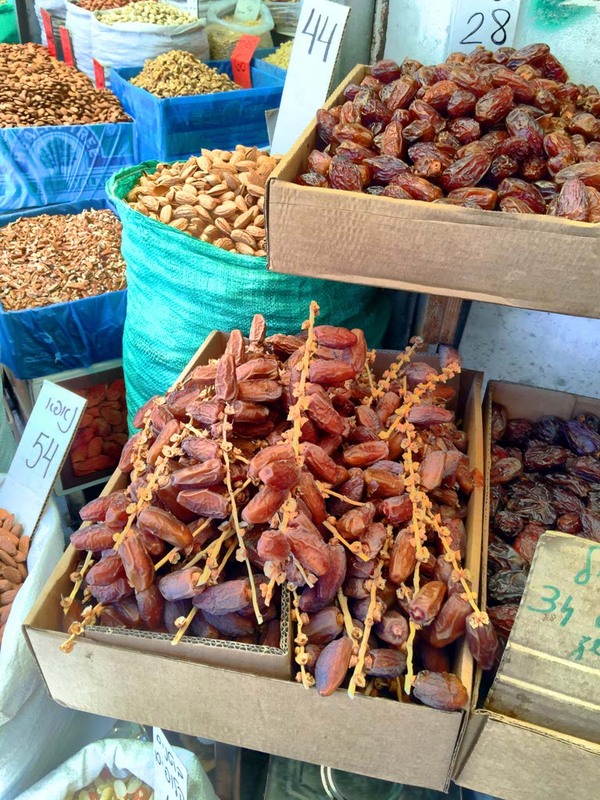 Have you had a chance to visit the open air markets? They have some incredible stuff. We spent two days roaming through the markets tasting food and shopping. There is so much to take in! Do you have a favorite market here? I haven’t been there in 10 years. There is no specific market that I remember. There is just so much to take in. It was an experience. It is different from what I expected too, but in a great way. Is Israel on your list? No, but someone I know had. She decided to pass. Wow I can’t believe everything’s okay there. No need to apologize for not mentioning violence. There is nothing the Israelis want more than to live peacefully and to keep on building and progressing, while the neighboring states do exactly the opposite. What part of Israel are you from? You are in for a treat! So happy you are enjoying our little jewel. GREAT pictures! These images are beautiful! Will you be visiting any of the religious sites like the “Church of the Holy Sepulchre,Church of Nativity, etc”? Thank you for sharing such an amazing experience. I, like so many others, misjudged the beauty of Israel. The Mediterranean is breathtaking! I can’t wait for the rest of your posts. I’m glad to read that others admit to having a misconception of Israel. (It makes me feel less naive. 😉 Now, I would gladly travel here with my family. I will still use caution, of course, but I always use caution when traveling with my family. Leslie what a great post. I’m so glad you’re enjoying Israel. The Israel you describe is the Israel I know. Have you been to Israel as well? Or maybe you are from here? Looks peaceful and quiet. Like a park or a vacation resort. You are right that it gives the impression of a shopping district at home (only I’m used to less Hebrew on the signs, ha ha). Looks beautiful, makes me want to go when it has never been on my travel list. Nice post! Interesting article and I am enjoying the posts and like seeing the other side of it. Never been to Israel but enjoying the beauty of it through your posts. !